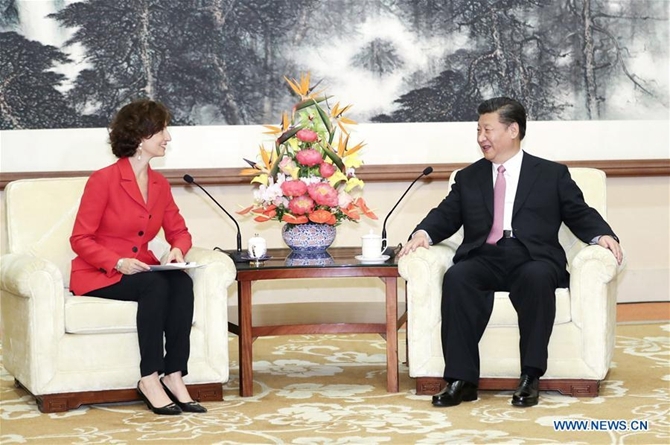 President Xi Jinping on Monday met with United Nations Educational, Scientific and Cultural Organization (UNESCO) Director-General Audrey Azoulay in Beijing. While welcoming UNESCO Director-General Azoulay for her first visit to China, Xi said the future and destiny of people all over the world were increasingly linked closely. "In the new era, China adheres to cultural self-confidence, vigorously develops educational, scientific, technological and cultural undertakings, and improves the quality of civility," Xi said. "China also upholds the concept of 'a world of great harmony' and harmonious coexistence, and advocates mutual respect, greater exchange and stronger mutual understanding for different cultures." China is willing to make greater contributions to advancing dialogue between civilizations, human development and progress, said Xi. "As the world's largest intellectual cooperation organization, UNESCO can play an important role in building a community with a shared future for humanity," Xi said. Stressing that the sustained and stable development of China's relations with UNESCO was conducive to global peace and prosperity, Xi said China attached great importance to UNESCO and firmly supported the important role UNESCO had played in advancing global development. "China is willing to deepen cooperation with UNESCO, work together for the benefits of the people of all countries, especially for helping developing countries progress in education, science and technology, and culture," Xi said. Azoulay thanked China for its firm support for UNESCO and spoke highly of cooperation between the two sides, saying she appreciated China's commitment to multilateralism. There is a resurgence of isolationism and unilateralism in the world today, said the UNESCO chief, suggesting that the international community should embrace openness and inclusiveness, uphold multilateralism, and advocate dialogue and exchange, which are the importance part of global governance. Noting UNESCO was highly compatible with Chinese concepts, Azoulay said UNESCO agreed with Xi's proposition to "build a community with a shared future for humanity." "UNESCO is willing to actively participate in cooperation associated with Belt and Road Initiative and contribute to global peace, security and cooperation," Azoulay said.